Carnation Bouquet is an exclusive peony variety that owes its name to the shape of its bud; it looks a bit like a carnation. 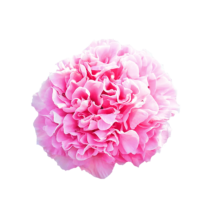 The bright pink colour of Carnation Bouquet is a real selling point; it’s completely unique! Carnation Bouquet variety is both rose-shaped and bomb-shaped. Initially it blooms in the shape of a rose but eventually turns into a perfectly round, cerise-coloured sphere. This peony has tough, green leaves and stems that are pretty short, just like those of Lois Choice. Carnation Bouquet can be somewhat top-heavy because of the large flowers and slight stems. Carnation Bouquet, like Lois Choice, is a variety loved by connoisseurs and enthusiasts. You have to be patient with this peony variety and provide a lot love. But it’s worth it, as Carnation Bouquet is a peony you’ll never forget! Carnation Bouquet was registered in 1996 by Bill Seidl, an American breeder.